Approved by City of Laurel Department of Park & Recreation. Cache is available DAWN to DUSK only. This the third of a series of various types of caches, centered around the the City of Laurel Walking Tour (CLWT). The walking tour highlights various historic sites in the city and was launched in 2006 as a cooperative effort between the City of Laurel and the Laurel Museum. From the CLWT brochure and marker - Nicholas Snowden built a grist mill on this site in 1811, using water from the Patuxent River to poer the mill. In 1824, the building was converted into a cotton mill. Snowden's son-in-law, Horace Capron, enlarged the mill in 1836 to produce canvas duck for Baltimore clipper ship sails and Conestoga wagon covers. The mill burned in 1855 and rebuilt in 1856 with automatic sprinklers. The mill was the largest employer in Laurel in the late 19th century. 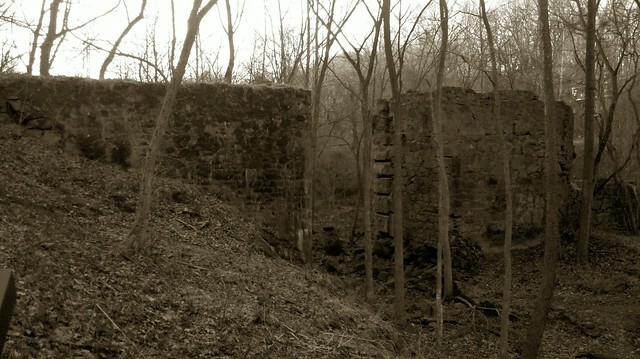 The remnants of the mill, dam and millrace can be seen on the Riverfront Park Trail. This will be a fairly short six stage mult-cache. All but the final will be along a paved or wooden walkway. Technichally, you can visit the preliminary waypoints / stages in any order, but my listed order will probably result in the least distance and less back tracking. The final is in a wooded area at N 39 06.ABC W 76 51.XYZ. Stage 1 - Laurel Factory: Prince George's County's Only Mill Town - At the listed coordinates, find the clipping from the "Baltimore American". It is dated June 2_, 1855. The missing digit = Z. Stage 2 - Laurel Cotton Mill and Dam - The Site 2 marker. The main body of the plaque is made up of 9 lines of text. Which line ends in the word "MILL"? Line # = C.
Stage 3 - Laurel Harnessed the River to Power the Cotton Mill (I) - Find the width of the dam. The sum of the digits = A. Stage 4 - Water From the Dam Powered the Cotton Mill - Number of buttons on George Nye's coat - Y. Stage 5 - Laurel Harnessed the River to Power the Cotton Mill (II) - One paragraph starts with, "According to newspaper reports in 185_..." The missing digit = X. Water powered how many overshot wheels? This number minus one = B. Stage 6 - The final! W 76° 51.535' Recommended - End of Main Street. 6 Final Location N ?? ?????? Ubyybj va n gerr nobhg 4-5 srrg hc. Frpherq jvgu n ebcr.